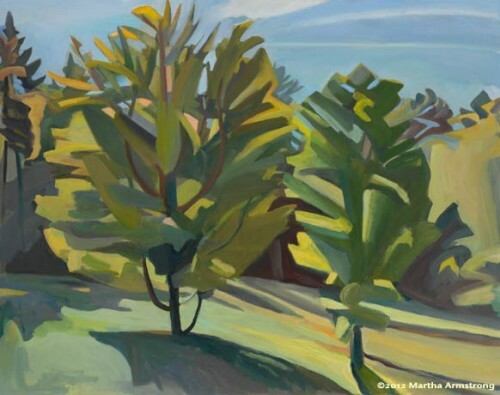 Larry Groff interviews painter Martha Armstrong. Armstrong comments: "I certainly start with something or someone I’m looking at, and often I’ll go from beginning to end just looking at each subject. But my whole motive will be to get what I see, and determine how to translate that into painting. That is the first question. How do you put that down? How do you make sense out of that visually in paint? It’s the most exciting thing in the world to do—to look and paint. But I don’t know if I end up there. I will take something back to my studio, and continue to work on it. However, the issues are completely different then... If you’re out painting a landscape you try to deal with what’s there. Take it into your studio and it’s a different story. You have to make a painting out of it. I get curious and try things, try to paint things several different ways- often destructively. You have to do what you have to do to make a painting. I can always take it back out again too, which I often do. It has to recreate my experience of looking at something, and I think the older I get the more complicated the world seems. I don’t want simple answers. I just want it to be truthful to how I see the world now and to get a painting at the same time, and that’s hard."